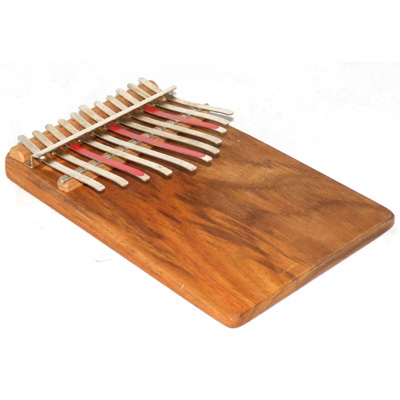 The Hugh Tracey Celeste Junior Kalimba - this model is thinner and ideal for smaller hands. The tone of the Celeste is a little softer than the Treble, but great for recordings. It does not have the vibrato holes, but a very ethereal sound can be obtained on a mike. like the Celeste, but with 11 notes tuned to a pentatonic scale and wider spaced for younger children. Made in South Africa from kiaat wood and high quality spring steel. Size: 18 x 13 x 4 cm.